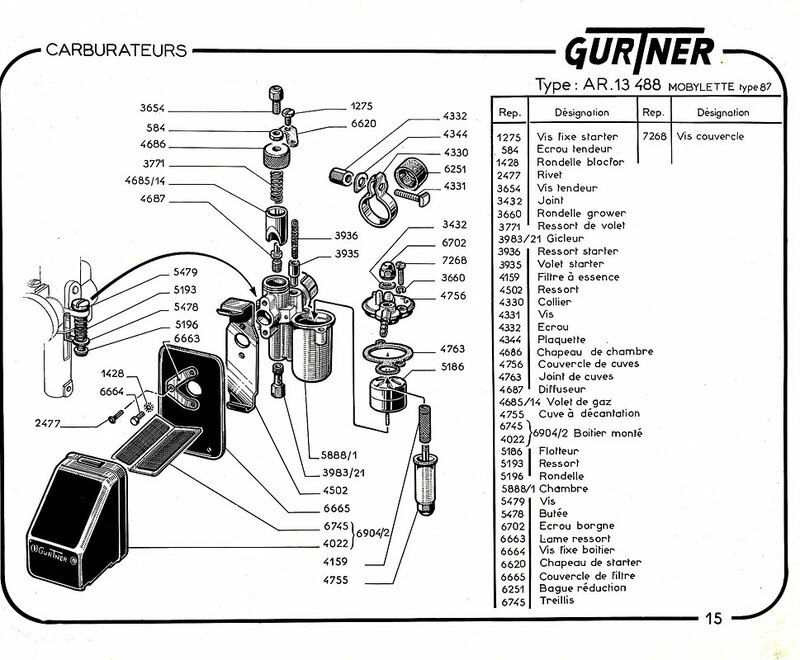 Gurtner carburetors are made in France, and original only on the French mopeds Peugeot and Motobecane. 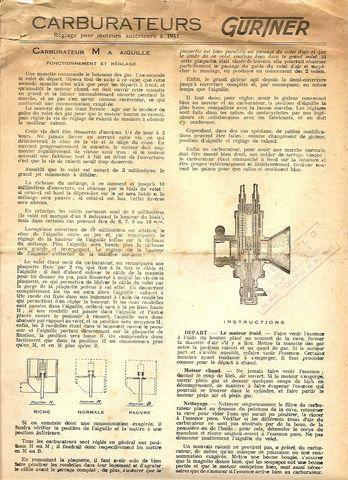 L, 102 has a fixed engine and piston port intake, to cylinder. R, 103 engine swings and has a reed valve intake, to case. 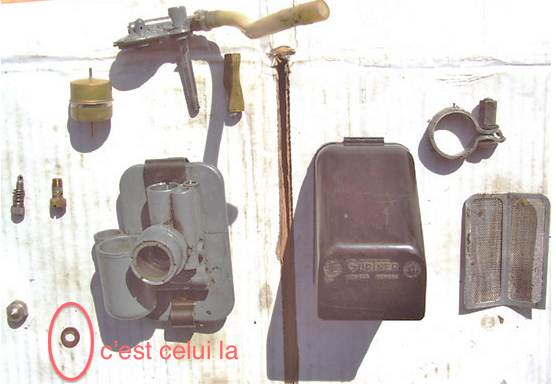 Part numbers: Peugeot is olive, Motobecane is dark orange. 102 and 103 combined. 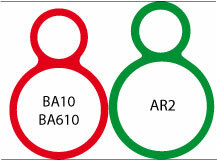 Part numbers with “b” are 102-only. New items prices are green. Used prices are dark green. 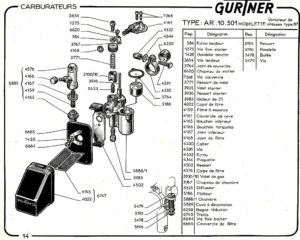 1970’s 103 types had Gurtner D12 carburetors. 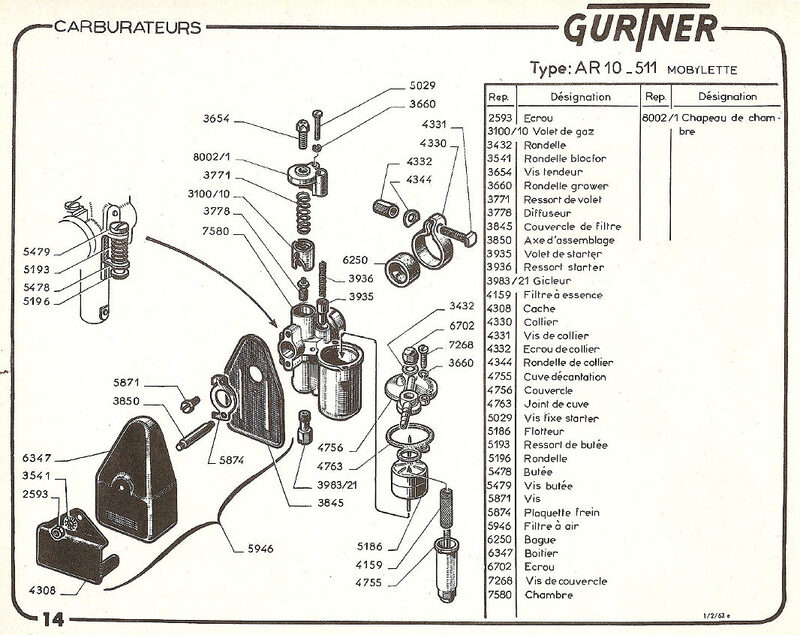 ’81-on 103/104 had Gurtner E12B carburetors. 7776 is pre-1978 12mm, thin stud, thin mount. 13512 is post-’78 12mm, thick stud, thick mount. 13510 is post-’78 10mm, thick stud, thick mount. Gurtner AR2 series moped carburetors have a large flange, like a wall. 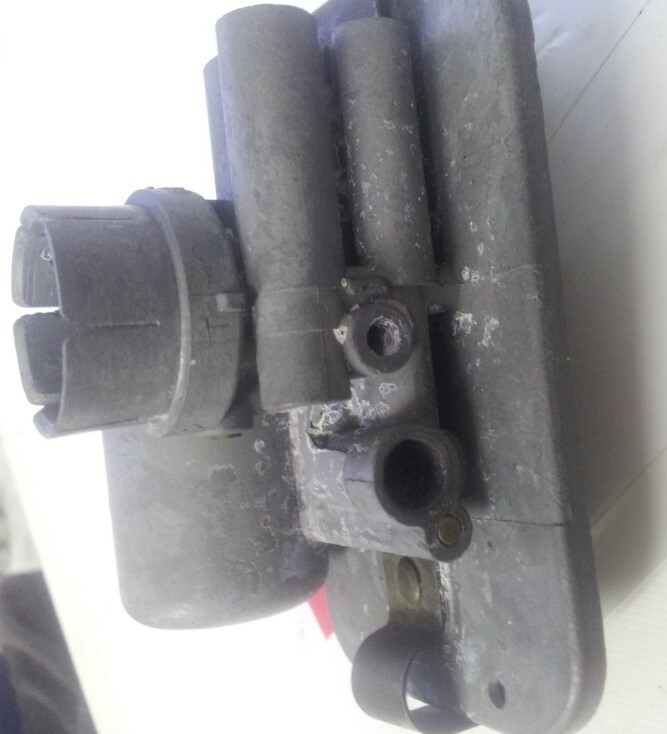 It is for an “air box”, a noise silencing, fuel mist recovering, and air filtering chamber. There are two (venturi) sizes, 10 or 12mm, and two styles, side or center mount. 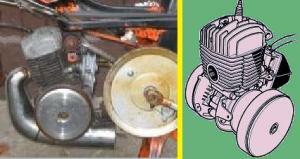 Center and side mount carbs look the same, but don’t interchange completely. 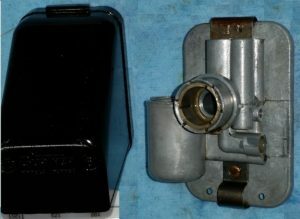 Side mount carburetors have threads for an air filter stud, side holes for a center mount air box clip, and clamp to a 19mm intake pipe. The side mount float top cover has a vertical fuel hose spigot. A stripped bare side mount body, as is, will exactly replace a bare center mount body. 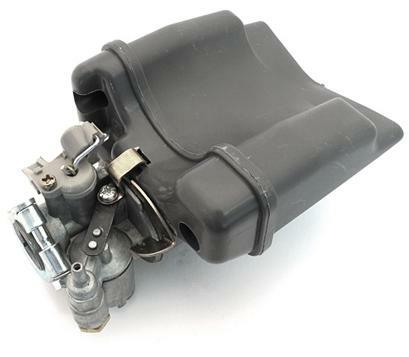 Center mount carburetors have no threads in the stud hole, side holes for a center mount air box clip, and have removable sleeves, black 16 x 19 (for AR210), and white 17 x 19mm (for AR212). The sleeves reduce the precision clamp size from 19mm to 16 or 17. The purpose is to be tamper resistant. The sleeves fit tight and are difficult to remove without damaging them. The center mount float top cover has a horizontal fuel hose spigot. 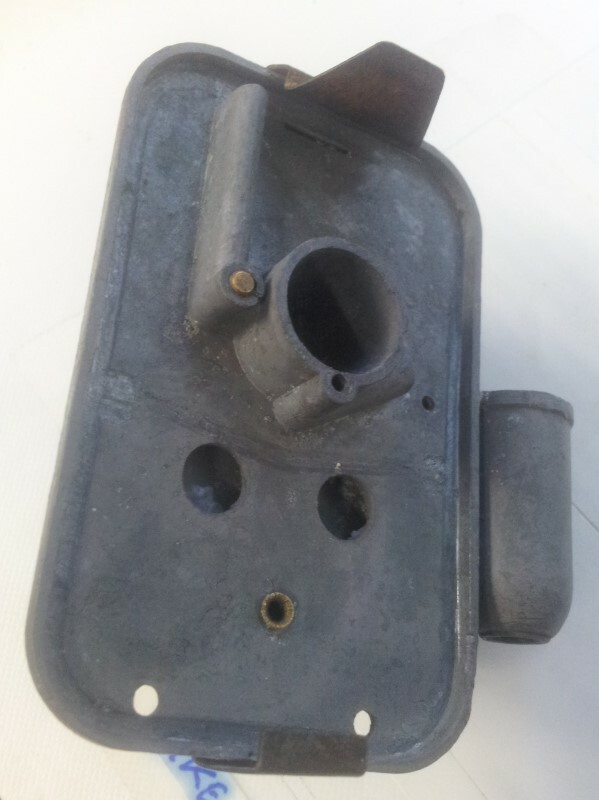 A stripped bare center mount body, after threads are cut in the air box post hole, will replace a bare side mount body. Center mount early Some pre-USA years 1960’s or early 1970’s had no fuel hose inlet in the float top cover. Instead it was in the carburetor body just below the float top. 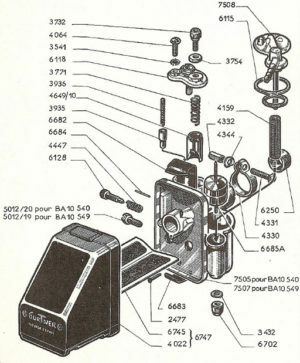 This type is in many Motobecane USA parts illustrations, but it was not used on any, or hardly any US models. In the illustration below it was edited out. 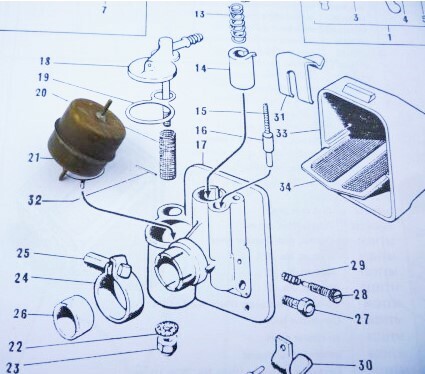 Out of 47 original carbs, taken off once-living Motobecanes from around Southern California, none were this “center mount early” type with the fuel hose spigot in the carb body. Center Mount Air Cover: The center mount type (short and deep) air box is too deep and sticks out too much as a side mount. The right side engine cover panel must be removed, and some kind of high-offset right pedal crank arm installed. Then maybe pedal threads are different. Side Mount Air Cover: The side mount type (tall and flat) air box is too tall and hits the frame as a center mount. More importantly, they break, fall off, and get thrown away, in addition to getting lost. Because of that, they have become scarce and pricey. From 2000-2015 maybe 200 people have asked for this item, but only two were available and sold at MM. The Motobecane piston-port two-stroke engine needs the air cover because the gasoline mist flows in and out in both directions. So there is a little cloud of fuel and oil mist out in front of the carburetor. Without the air cover, this fuel cloud gets wasted and blown away (or ends up on the riders right leg or shoe). Besides that, the air cover provides the correct amount of flow restriction, which is a good thing, up to a point. See below about running without an air cover (how it can damage the engine by over-heating from not enough fuel and oil). New prices are green. Used prices are dark green. MB carb mounts early (thin) and late (thick). 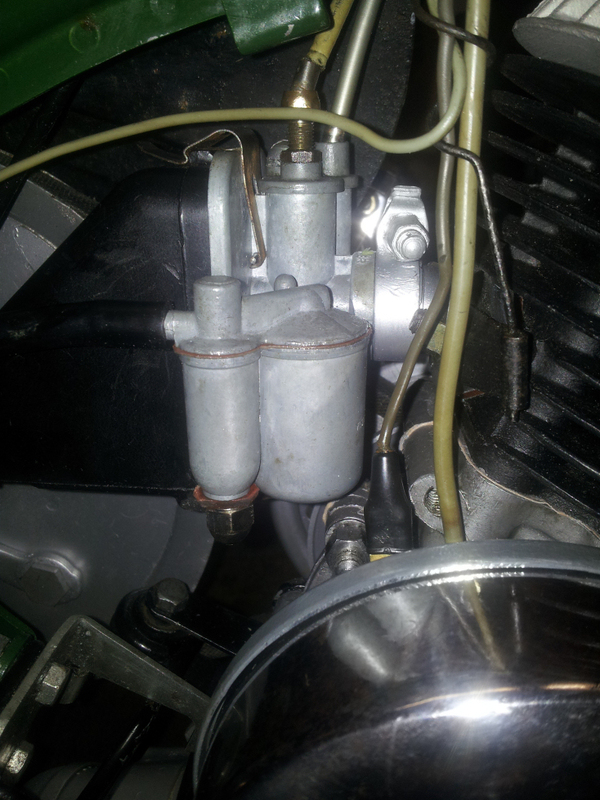 Mount Type: All Motobecane carbs clamp to 19.0mm inlet pipes. 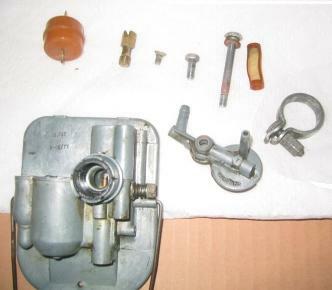 But many of the pre-March 1978 carburetors were cracking at the edge of the clamp, or the base of the petals. 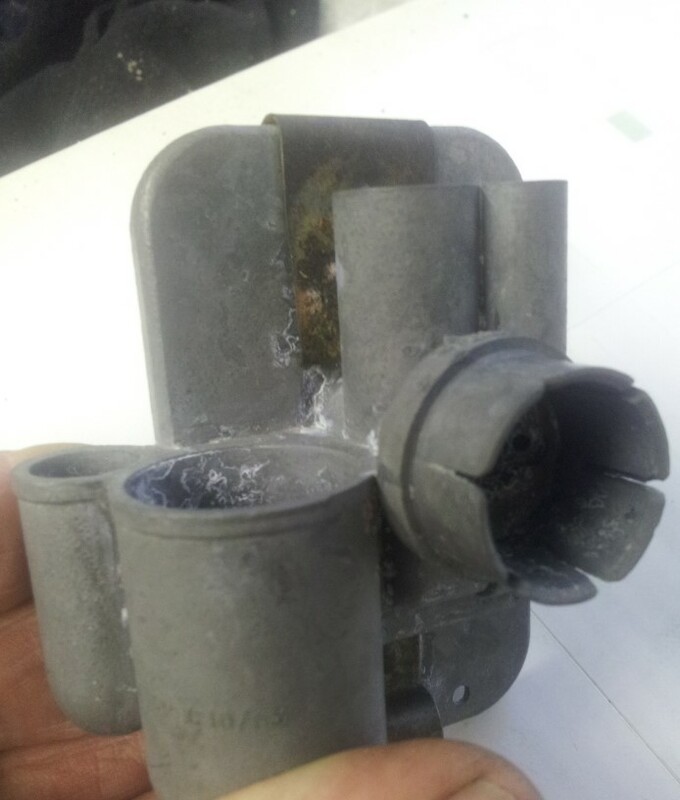 So Gurtner beefed up the carb body with a reinforcing ring, made the clamp petals about 1mm thicker each, and changed the clamp to the bigger Peugeot double-wall type. 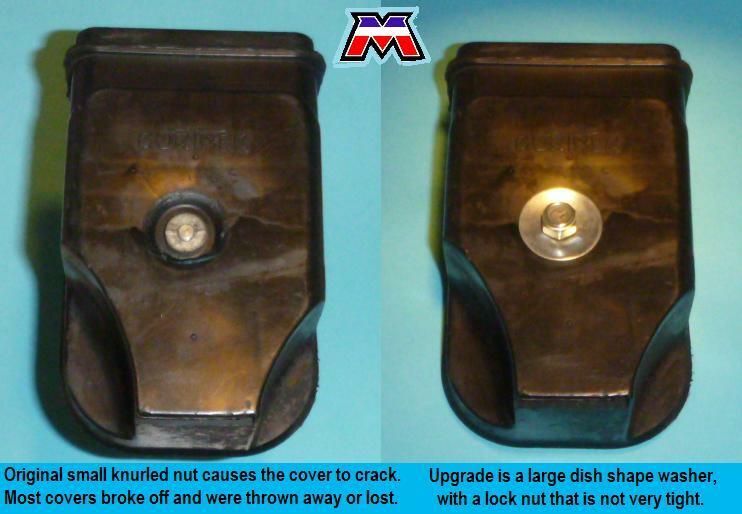 Air Filter Stud: When the mount was made stronger in 1978, the air filter post was also beefed up from 5mm to 6mm. This made the threads in the body more resistant to stripping. Another issue that was improved is when the air filter stud is over tightened, a bulge can form in the float chamber wall behind it. That bulge makes the float stick. See below. 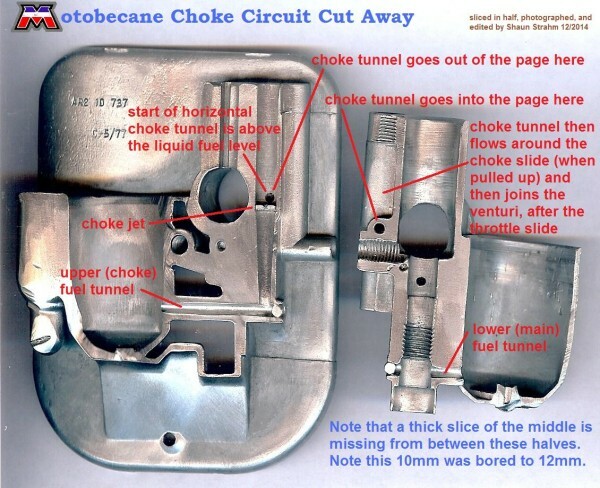 Choke Slide: This is often mysteriously missing, but actually stuck in the lowest (normal) position, either by tar or corrosion. It can be unfroze with solvent and/or by removing the cable wire and pushing it up from the bottom by tapping with a small punch and hammer. When the choke slide is pulled up, the choke is “on” for cold starting, and an extra fuel path is exposed by the step in the choke slide. If the choke slide is actually missing, the choke would be “on” all the time, but some extra air gets in along with the extra fuel. So the net effect of running without a choke slide is minor. 1. 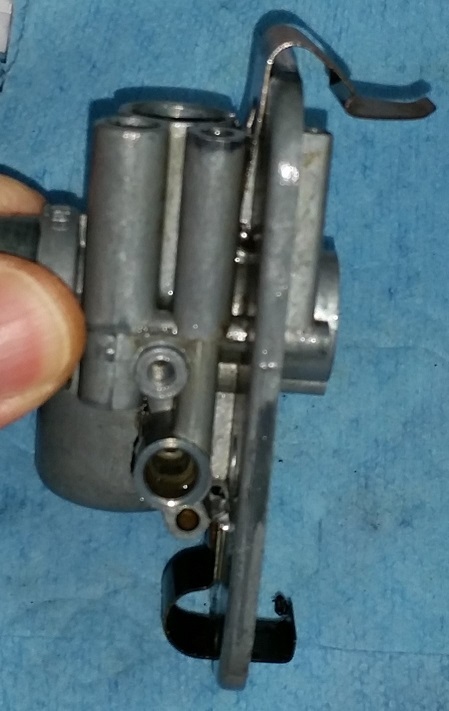 On center mount carburetors, for variator models, the choke cable is “top pull”. The choke and throttle cables detach, allowing the carburetor to be serviced away from the bike. 2. On side mount carbs for non-variator (Dimoby) models, the choke cable is “top pull”, but has a elbow (curved tube), like the throttle cable. 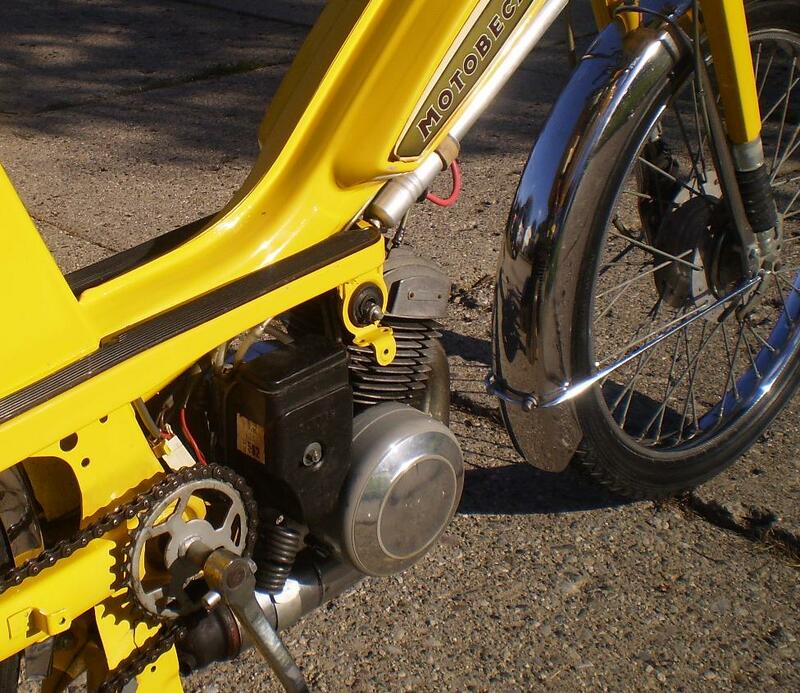 The choke and throttle cables detach, allowing the carburetor to be serviced away from the bike. 3. 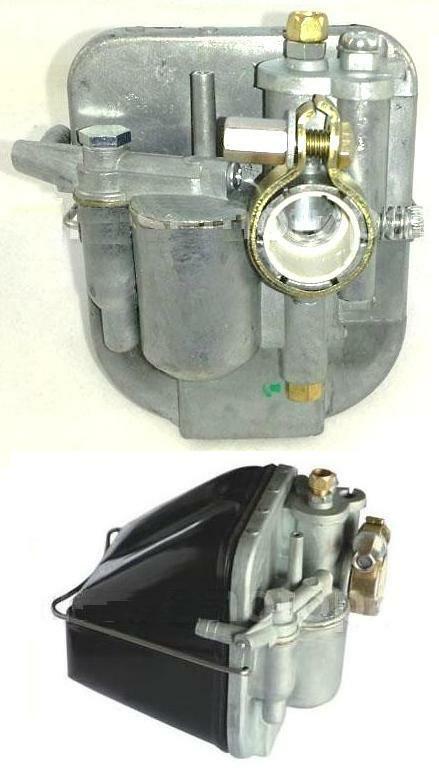 On side mount carbs for ’78-later 30mph variator models, the choke cable is “bottom pull”, where the choke wire runs through the carb body, trapping it on or near the bike. On those most service operations are done with cables attached, about one foot away from the bike. To remove the carb you have to pull the choke wire all the way out. Then it won’t usually go back because the braided end gets frayed. Then the choke wire has to be replaced. Le Diffuseur: When you look down the “throat” or venturi of a Gurtner carburetor, with the throttle wide open (throttle slide up and out of the way of the air), the little brass tube that sticks up from the floor of the venturi is the diffuser. It sprays the gasoline mist sucked up by the moving air. Left, top are the way more common type, the “slide fit” type diffusers. Can you see, besides the main large hole down the middle, that each diffuser has two small holes facing out of the page? Those are the idle holes. When they are blocked, the engine will run OK, but will not run slow or “idle”. See below. Left, bottom are the less common type, the “press fit” type diffusers. You can only see one idle hole on this kind, but there is another on the opposite side. These diffusers have a very small center hole, that serves has the limiting jet. They are installed by pressing in from above, instead of sliding in from below like the other kind. The purpose of this type is to be tamper resistant. There is no particular direction that they have to be aimed at, and no flat side in the carb body for that purpose. 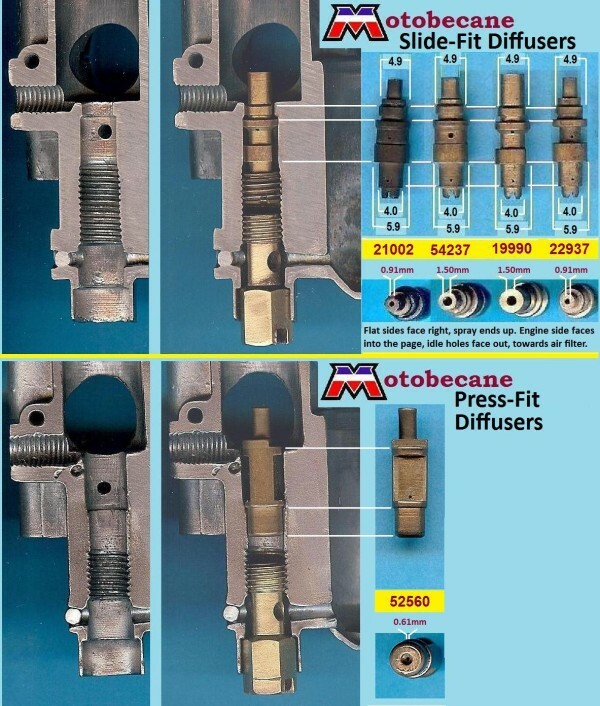 Slide Fit and Press Fit Diffusers: Some Motobecane carburetors have “press fit” diffusers, instead of the usual “slide fit”. This is one of those types (AR2-10-737 or AR2-10-991 or perhaps others) that has been sliced in half to expose it’s secrets. While “slide fit” diffusers slide in and out from the bottom, this “press fit” diffuser 52560, and carburetor type, slides (presses actually) in or out from the top. Many of these get smashed on top by Motobecane mechanics trying to push the diffuser downwards, the normal way out. 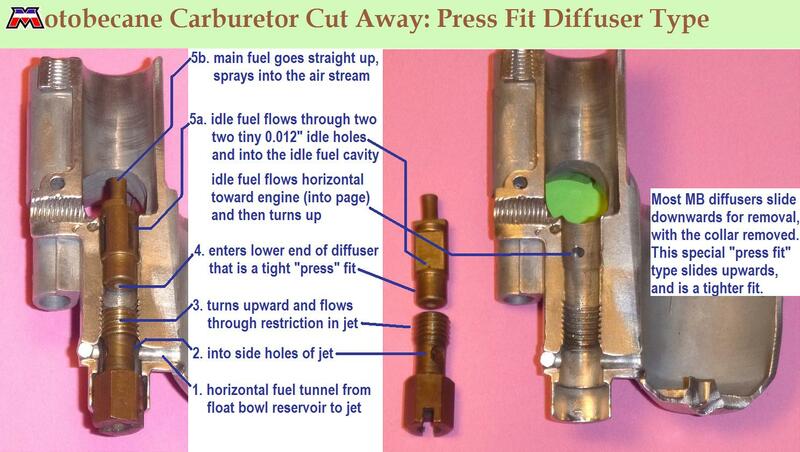 Press-fit-diffuser carburetors cannot be made to accept slide fit diffusers. Choke (cold starting) system: Unlike the Peugeot Gurtner and most other moped carburetor chokes, the Motobecane Gurtner AR2 has an additional fuel path or tunnel. It’s “choke” is a fuel enrichment device rather than an air restricting device. The choke circuit is completely independent of the main fuel circuit. It has it’s own fuel tunnel out of the float bowl, that bypasses the throttle slide, diffuser, and jet. Original Equipment Carbs have Dates: This carburetor clearly shows it’s manufacture date of 5/77, below the model number. It could be from a late 1977 or a 1978 bike. 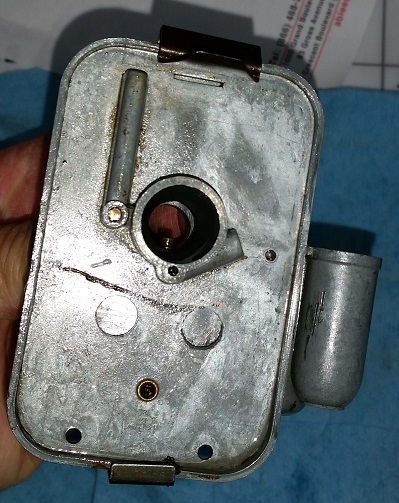 The 39 used Gurtner AR2 carburetors in Myrons Mopeds inventory on Dec 2014 have dates ranging from 03/74 to 04/80. The majority are from 1977 and 1979. See above “Population Study of Gurtner AR1 and AR2 Carburetors in Southern California”. 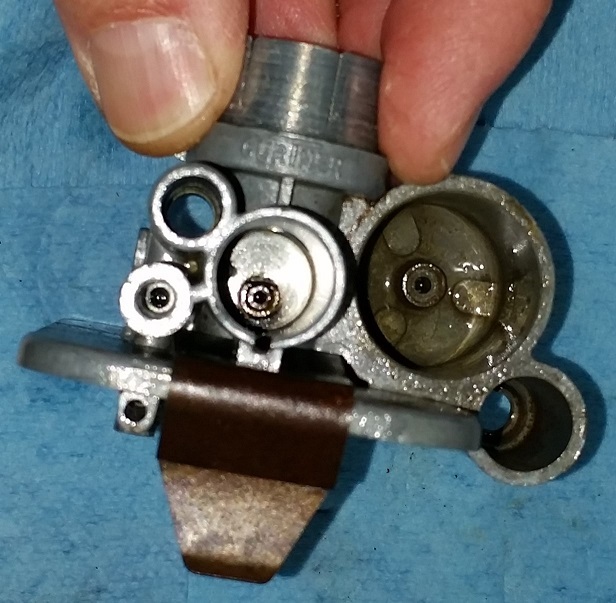 In US mopeds, this carburetor was only on one model for one year. 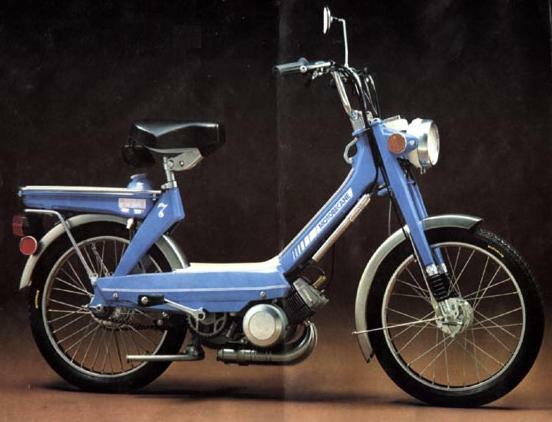 That lone French pony was the 1978 Motobecane Model 7. 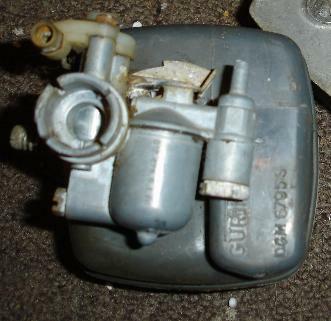 This carburetor was, no doubt, also used on many 1960’s or maybe 1950’s cyclomoteurs worldwide. But in the US it is uncommon (since mopeds weren’t “welcome” until the 1970’s). Only 2 or 3% of the Motobecanes sold in the US were Model 7. Three views of the Gurtner AR1-12-884 carburetor. New Gurtner floats with original needle lengths and positions. Gurtner Floats: Of the three Gurtner floats, that look like they should interchange but do not, the AR2-type 14101 (Motobecane) Gurtner #4901 is the largest, followed by the AR1-type 14123 (for MB Model 7), and the smallest D-type 06437 (Peugeot) Gurtner #6437. 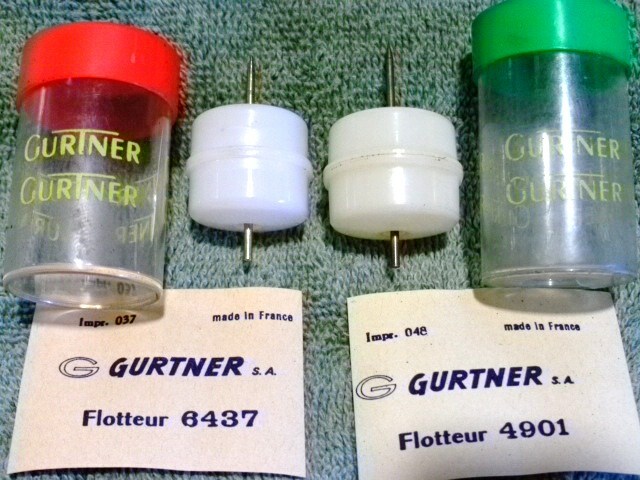 Gurtner used to color code their new float containers green for Motobecane and red for Peugeot. Otherwise they are almost indistinguishable, unless together side by side. Float Service: On plastic types the needle is a press fit into the top and bottom holes in the bulb. The needle can simply need moving up or down. Or it could also need the tip straightened and/or sharpened/machined. Or the needle could need to be replaced, if it has become too short or too bent. Any piece of 1.5mm brass rod, cut to these lengths, and machined to a cone tip, would restore the float. In addition, a gasoline-proof sealant should be used to seal the press-fit holes, as a precaution, or if gasoline enters the bulb. Here are other Gurtner carburetors, not just the 1970’s USA ones. 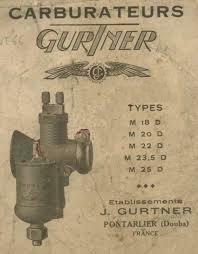 History: Jules Gurtner started making carburetors in 1907, for some of the earliest automobiles and motorcycles. After 1959, some had 10mm carbs and went 25mph, and some had 13mm carbs and went 30-35mph. 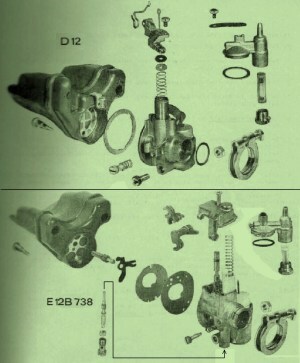 Most of this information and photos are from the Motobecane Club of France. 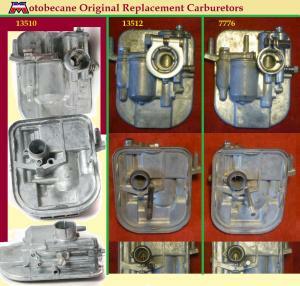 These 47 Motobecane carburetors all came from whole bikes that were stripped out for parts. The Motobecane population in the greater Los Angeles area is roughly represented by this large subset. Out of 47 carbs there were only two AR1 types, from Model 7. All of the 45 others were from Models 40 and 50. These are the surviving Motobecane carburetors that lasted longer than the rest of the bike. If there were times when the metal was weak, those months or batches would be missing from this collection, pretty much, because the ones that tended to break already broke and were thrown away. It seems like 1978 is missing some survivors, mysteriously. Perhaps they were used as upgrades/replacements for 1976-77 thin-mount ones that broke. 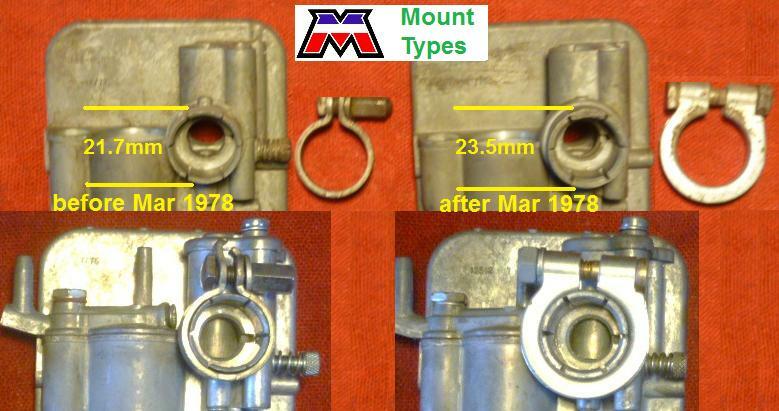 You can see from this sub-population that early carburetors were center mount, and late ones were side mount, and in between was both. This entry was posted on Thursday, July 14th, 2016 at 8:06 am and is filed under Gurtner. You can follow any responses to this entry through the RSS 2.0 feed. Responses are currently closed, but you can trackback from your own site.